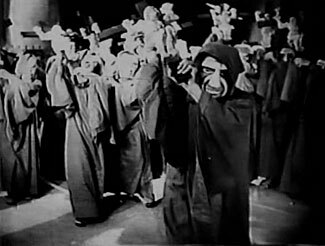 La Llorona (1933) may have been Mexico's first horror film, but the first great Mexican horror film appeared the following year. In El Fantasma del Convento (1934), three travelers on the verge of a crisis spend the night in a brooding, atmospheric monastery somewhere on the border between life and death. El Fantasma... holds up remarkably well, not only by comparison to the films Hollywood was producing at the time, but even by modern standards. It's also one of the first films in horror movie history to confront its audience with unflinching images of death and decay, including one of cinema's earliest Moving Cadavers. 1. Many years later, in 1979, Carlos Enrique Taboada would make La Guerra Santa , a very similar film about the dehumanizing cruelty of war, this time based on the "Cristiada" war of the late 1920's.
. Though appreciation for Vámonos... was a long time coming, de Fuentes secured a solid place in Mexican cinema with his 1936 film Allá en el Rancho Grande , the first Mexican blockbuster. 2. Compare, too, the career of Ismael Rodríguez: if you look at SOMOS magazine's list of the 100 greatest Mexican films, you will find his work listed 8 times. That's more than Luis Buñuel (7 films, made during his years in Mexico). That's more than de Fuentes and Juan Bustillo Oro combined (7 films, one co-directed by both of them). But the only movies of Rodríguez's we gringos tend to know are The Beast of Hollow Mountain (1956) and Autopsy of a Ghost (1968, starring Basil Rathbone and John Carradine)... neither of which are ever going to show up on anybody's list of Top-100 anything.
. In fact, de Fuentes had gained some early experience serving as co-writer on an earlier Mexican film: La Llorona ! And just as his writing experience for La Llorona served him in good stead when he went to make his own horror film, so too did the experience of writing El Fantasma del Convento help de Fuentes's colleague, Juan Bustillo Oro. de Fuentes and Bustillo were both intelligent, accomplished and well-rounded men: de Fuentes had studied philosophy at Tulane University, while Bustillo trained in law before becoming deeply involved in theatre. 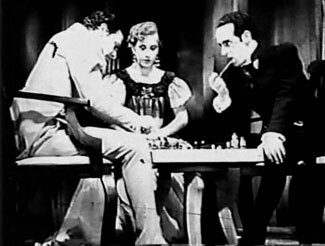 While de Fuentes is noted for having made his series of films on the human consequences of the Revolution (one of which, El Compadre Mendoza , was co-directed by Bustillo), Bustillo established himself at the same time through his involvement with a group called El Teatro de Ahora. Bustillo wrote and produced several plays for the group which called attention to the social and political problems facing the new Mexican republic. 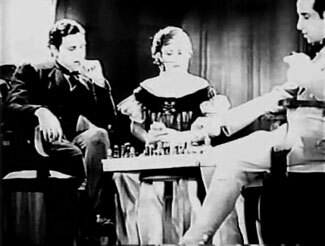 Technically, Bustillo had begun his directing career even earlier than de Fuentes, having directed the silent film Yo Soy tu Padre in 1927 (shortly after his law studies had completed); but he chose to concentrate on theatre, until his collaboration with de Fuentes encouraged him to devote himself to the creation of a new national cinema. Like de Fuentes, Bustillo made successful films in many different genres, distinguishing himself particularly in comedy and in popular melodrama. Unlike de Fuentes, though, Bustillo maintained an interest in horror beyond his initial foray in the early 30's, culminating in one of his finest films, 1950's El Hombre sin Rostro ("The Man Without a Face"). 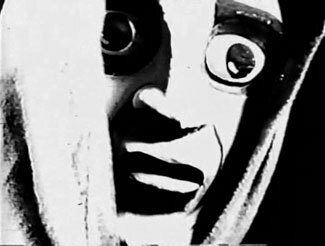 El Hombre... is particularly memorable for its Expressionist dream sequences, in which a detective on the trail of a mass-murderer is haunted by increasingly-bizarre images, including the terrifying figure of the title. 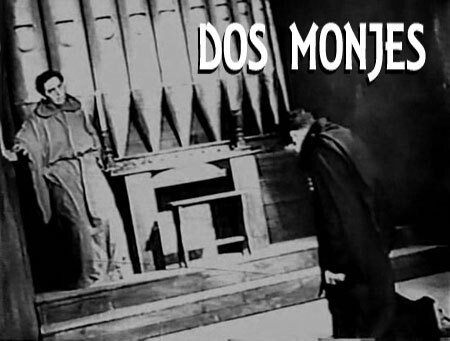 The roots of this film's imagery can be found in Bustillo's very first sound production, which is also on SOMOS magazine's list of the 100 Greatest Mexican films: 1934's Dos Monjes ("Two Monks"), an experimental film made in a pure Expressionist style that left his audience bewildered when it was first released. Dos Monjes is usually referred to as a horror film, but in fact it doesn't really venture into horror territory until the very end. However, the details of the mis-en-scène give the entire film a feeling of unease: there are few right angles in the set design, and even common objects like windows or clocks are subtly distorted. 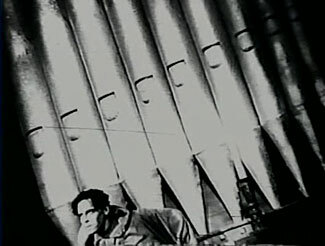 The lighting and camera work also contribute to giving the film its restless, disturbed feeling. Like La Llorona , the plot of the film involves a wrapping story set in the present (or the movie's present, anyway, which in this case is the mid-19th century); two extended flashback episodes provide the background for the crisis that comes at the end. However, unlike La Llorona — which tended to lapse into Hollywood cliché, and never made a convincing whole out of its several parts — Dos Monjes is original, tightly plotted and intensely focused. The wrapping story is set in a monastery — the Cloister of Saint Caligari, by the look of the architecture and statuary. A certain monk named Brother Javier, newly arrived at the monastery, is in very poor health. He's probably dying of something like tuberculosis, and in the depths of his illness he is raving like a man possessed by the Devil. The Prior has called upon the most dedicated of his monks, Brother Juan, to give him comfort and absolution, and deliver him from the clutches of Satan. However, when Juan enters the cell of the dying man, Javier recognizes him. "Damn you!" he cries; when Brother Juan calmly removes himself from the cell, Javier springs up and follows him. Javier grabs a heavy crucifix from the wall and uses it to bludgeon Juan nearly to death. Years ago, when Javier was younger, he had been a poor musician, living with his mother in a small town. Even then, he had been fragile and in very poor health; but he had his music to sustain him... and the inspiration for his music was the beautiful girl next door. Even though he had never spoken to her, and didn't even know her name (Ana — Anita) until his mother told him, he had fallen in love with her. He would see her listening at the window, as he played and sang his passionate love songs. If only her cruel parents wouldn't drag her away when they caught her! If only he had a chance to speak to her, to tell her how he felt, then he imagined she would love him, too. On day, Javier saw a suitor arrive at Ana's door. What happened next, Javier could see as a play of shadows on the drawn blinds of the house across the street: here Bustillo uses the conventions of silent cinema to great effect (in marked contract to La Llorona , which seemed to lapse back into silent-film convention more out of habit than genuine commitment). Ana refused her suitor, and her furious parents threw her out into the street. Javier immediately sprand to her rescue. With his mother's whole-hearted approval, he brought the poor disowned girl into their home. Months passed, and a tender bond formed between Anita and Javier. Soon, Javier was beginning to plan for their marriage, much to his mother's delight. Now, Javier, in spite of his good intentions, was only a poor, sickly musician. He depended a great deal on the support of his wealthy best friend Juan. But Juan had gone off into the country to build his fortune, and nobody had heard a single word from him in two years. One day, Javier had a dream in which Juan returned to the village, but their reunion was not a happy one. Javier awakened from this dream to find that Juan had indeed returned. Putting aside this premonition, Juan had welcomed him home — after all, Juan was not only his friend, but his benefactor. From that point on, Javier tried his best to bring Juan back into his life, to have him share in his happiness with Ana. A relapse of Javier's illness almost killed him, but with Ana's tender ministrations he had fought his way back to life. With his doctor assuring him he would live many happy years yet, and Ana's promises to stand by him always, Javier had felt he could at very least live through the spring: one happy, perfect spring. That would be enough for any man. But as he recovered, he began to notice a change in Juan: a growing distance, as though he were hiding something. Javier's mother tried to convince him it was for the best — that, during his illness, the closeness that had arisen between Juan and Ana might be, well... misunderstood. Javier sensed that his mother knew more than she was admitting, and though she had denied it, Javier began to wonder why Juan had been so anxious to send him to the country to recover. Could there be something between Juan and Anita? Javier confronted Anita, who denied everything: surely Juan was only preoccupied with family matters, and that was the reason for his strange distance. Juan himself said the same thing, when he eventually came to see his old friend. Pressing financial issues had interfered with his dreams of a comnfortable retirement: he would have to leave his home and his friends and take up his travels oncce again. But before he did that, he would need Javier to do a favor for him: could he go to see Juan's lawyer to dispose of certain documents it wouldn't take much time, and he would be forever grateful. It was an odd request, but Javier was glad to comply. However, while he waited in the lawyer's office, his illness had begin to creep back. Overcome by a coughing fit, he was soon in too poor shape to follow through with the favor. His mother offered to stay on his behalf, and with the reassurances of the lawyer that everything would be all right without him, Javier had gone home. Once there, he had found Juan's hat and walking stick in the foyer. Looking into Ana's room, he had seen Juan forcing himself ion his fiancée, who strggled to break free from his embrace. Picking up Juan's walking stick, Javier ran into the room and struck Juan across the face. Enraged, Juan had pulled a gun... but just as he pulled the trigger, Ana had thrown herself between the two men. The shot killed Ana; Juan had disappeared into the night as Javier knelt by her side. The Prior is moved by Javier's story. But he insists that the only was he can be absolved is by doing as Christ commanded and forgiving his enemy. He must do this perfectly, unreservedly — and in person. He leaves without granting Javier absolution, so that he can hear the story from Juan and determine how much is true. The reason that Ana had refused her suitor, and consequently been disowned by her parents, was that she was already engaged — to Juan. Juan, in his zeal to earn his fortune, had made the fatal mistake of losing contact with Ana, and with everyone back home, for two whole years... to the point where everyone assumed he was either dead or never coming home. When Javier had come to Ana's rescue, she had been touched by his obvious devotion to her. It was also painfully clear that his devotion was practically the only thing keeping him alive, so Ana had encouraged him. And then Juan had reappeared. Juan had realized it was largely his own fault that Ana had grown away from him; he also realized that it was selfish of him to continue to nurse a grand passion for Ana when his best friend so clearly needed her for his own survival. Anita, too, found the situation difficult, because she had never really got over her love of Juan any more than she had truly fallen in love with Javier. But it was plain that Javier would be dead very soon. Though Javier's doctor had told him otherwise, he'd said something very different to Juan and Ana as soon as they were out of the sickroom. Juan and Ana had determined to stick to the charade as long as Javier lived. Javier's mother, overhearing them confess their continued love for each other, demands that they continue to pretend — to do otherwise would kill Javier. It's shortly after that that his mother's troubled conscience had alerted Javier to the fact that things were not as they seemed. Juan then determined to leave town, to remove himself from temptation. But he couldn't resist seeing Ana one more time before he did, and that was why he sent Javier and his mother to do some business for him. When Javier had come back and found the two of them in a compromising position, Juan's suppressed passion and rage had overcome him. He'd drawn his gun without considering what he was doing, and before he could recover himself, Ana was dead. Thereafter he had fled, and immersed himself in the life of the monastery has penance for his terrible sins. The Prior, weighing these stories, goes back to Brother Javier's cell. But before he arrives, one of the monks comes to tell him that Javier has gone into a kind of delirium, like a man possessed. Surrounded by the distorted statues of the saints, Javier stumbles to the great gothic organ and begins to play one of the sentimental romanzas he wrote for Anita. The blasphemous sound of this music, thundering out from the church organ at full volume, draws the other monks of the monastery out of their cells in dismay and horror. The dying Javier begins to hallucinate: he sees the monks as hideous masked figures coming to pass judgment on him, advancing on him with heavy crucifixes, to beat him to death as he wanted to kill Juan. He remembers striking down his old friend — why? Out of remorse? Or exulting in his ability to achieve the revenge that (ironically) had been the only thing to keep him alive all these years? His vision clears for just a moment, as the penitent Juan appears before him on his knees. Javier stands up and begins walking toward him — to offer his forgiveness? To kill him? We don't know, and we'll never know, because before he can say or do anything certain, he falls to the ground — dead. The horror of Javier's dying visions is compounded by another horror: he has died without receiving the absolution he needed. The film ends with Javier's improvised weapon, the crucifix, hanging over his tomb, while Juan — as silent an motionless as a shadow — keeps vigil in prayer. Dos Monjes was not well-received in 1934. Its heavily-Expressionist style and its obvious artificiality were not what audiences of the time were used to. Modern critics have sometimes gone a little too far in the opposite direction trying to garner appreciation for this overlooked classic of Mexican cinema: for example, some point out that its use of multiple points-of-view looks forward to Kurosawa's Rashōmon . In fact, the two movies are significantly different. In Rashōmon , which also concerns a fatal love triangle, all three of the participants get to tell their side of the story... even the dead one, who communicates through a medium. the point of this is to demonstrate that all three tell the story to put themselves in the best possible light — and may even believe their version of the story to be absolutely true. However, none of them reckon on the presence of an objective fourth witness, whose version of the storycasts everything into doubt. By contrast, there is little ambiguity even suggested about the two stories on Dos Monjes . Javier's side of the story is absolutely true, even on Juan's own admission — but it's incomplete. As for Juan's telling of the story: he doesn't attempt, Rashōmon -style, to make himself look better. He admits his fault, and admits his culpability for everything that's happened. But he also provides the crucial missing context that explained why he behaved as he did. 3. In Bustillo's time, if not necessarily in the mid-19th century, when Dos Monjes takes place. that the white player moves first. And who moved first is, after all, the crucial point of the stories. It's not really necessary to make extraordinary claims for the importance of Dos Monjes . It's an amazing film on its own. Certainly its visual style in unlike anything else in Mexican cinema of the time, and even Bustillo himself would not attempt anything similar until El Hombre Sin Rostro some 16 years later. Its theme of betrayal, however, is common throughout Bustillo's work. In this respect, it makes a very interesting companion film to the Bustillo-scripted Fantasma del Convento — with which it also shares a monastery setting. His next horror film, El Misterio del Rostro Pálido (1935), is also concerned with multiple levels of betrayal; and even his classic comedy Allí Está el Detalle (1940), Cantinflas's breakout film, is obsessed with misunderstanding, mistaken identities and double dealing. And his last horror film, El Hombre Sin Rostro , is probably the ultimate example of Bustillo's hero being betrayed by the one person he trusted most, and failing to grasp the one vital fact he needs to understand his own story.